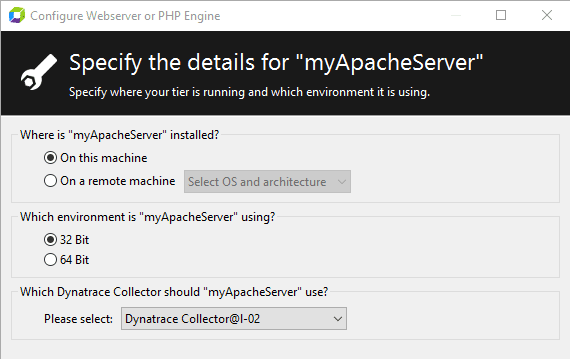 Map your application tiers to the System Profile. AppMon 2017 May In Cockpit, right-click the System Profiles node, and select Create System Profile. AppMon 2018 April and later In the session selector, click Manage System Profiles, then click Create System Profile in the System Profiles dashlet. Set the unique name for the new System Profile. You can also click Tools > Create System Profile. 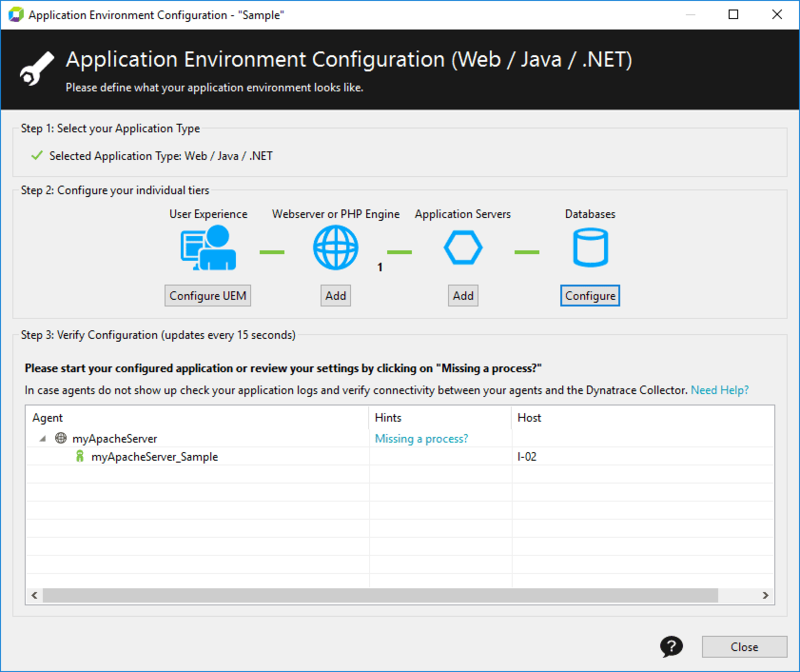 In that case you proceed to the Application Environment Configuration dialog box automatically, and can skip step 2.1. To receive data from Agents, you need to map them to your System Profile. It is done in the Application Environment Configuration dialog box. AppMon 2017 May Click the default Monitoring Perspective button, then select the new System Profile in the breadcrumb navigation. AppMon 2018 April and later Select the new System Profile from the session selector, then click Monitoring Overview in the System Profile section of the sidebar. Depending on the selected technology, you have different sets of tiers to configure. Click Add under the required application component. An Agent Group is created for each tier. 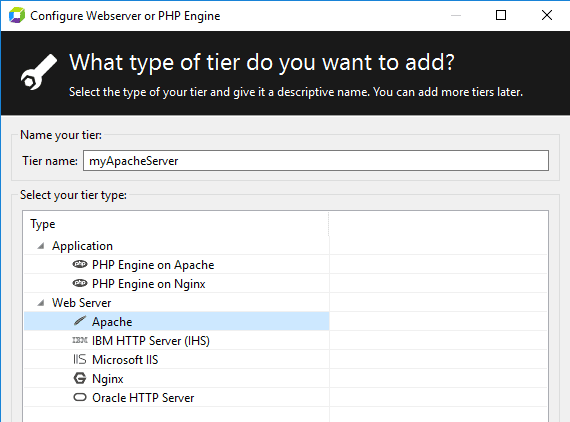 You can find several examples of tier configuration in child topics of the Application Environment Configuration page. 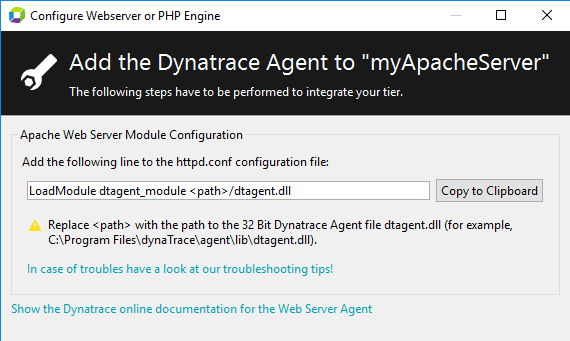 To learn how to configure Database Agent, see Database Agent configuration. Set a unique, meaningful name for the tier. Select its technology. Specify the tier location, which environment it uses, and, if needed, which Collector should its Agents use. If you already have your Agents installed on the application&apos;s machine, skip this step. Download and install the Agents. See Install agents for more information about it. Adjust Agents configuration. The adjustment process varies depending on the Agent type. 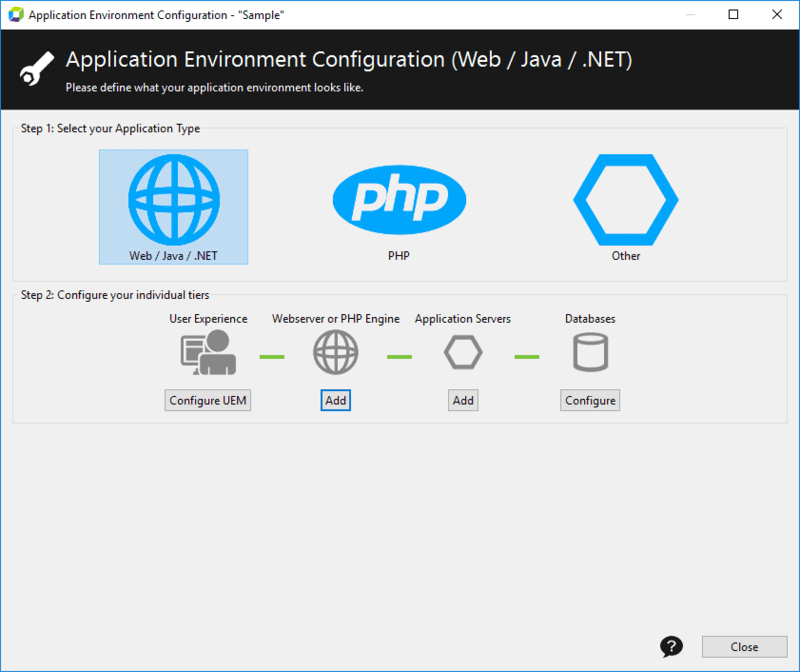 Follow the instructions from the Application Environment Configuration dialog box. 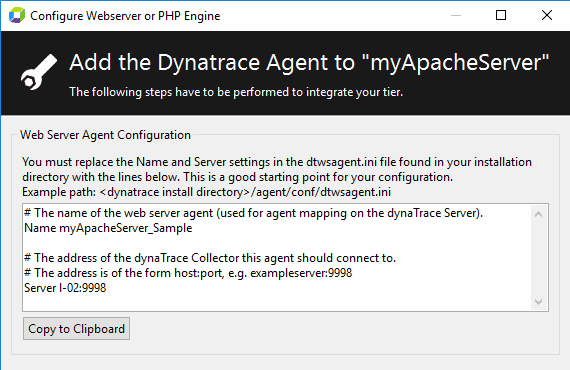 Restart your application, or just the newly instrument tier of it, for the Agent to connect. You can skip that step, and restart the app when all tiers are instrumented. Windows systems for web servers and IIS require two or even three restart steps. Restart the AppMon Web Server Agent Service through the Windows Services. 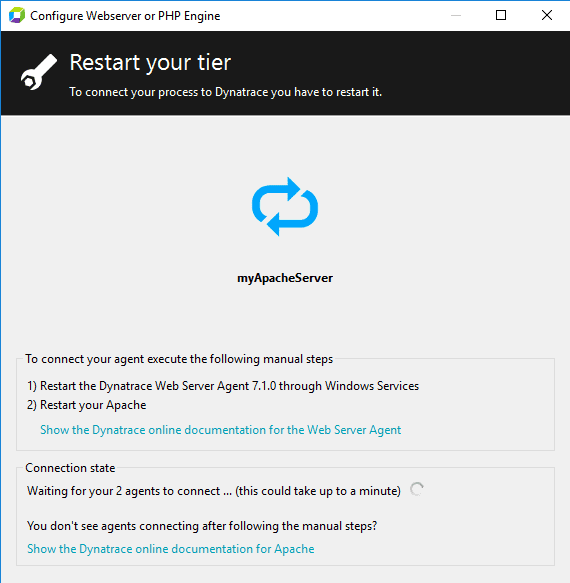 Restart/Recycle your IIS Application Pool through the IIS Manager. Access your application&apos;s web site through the browser (ensures that, for example, ASP.NET is loaded). Review the connected Agents. If needed, add more tiers. 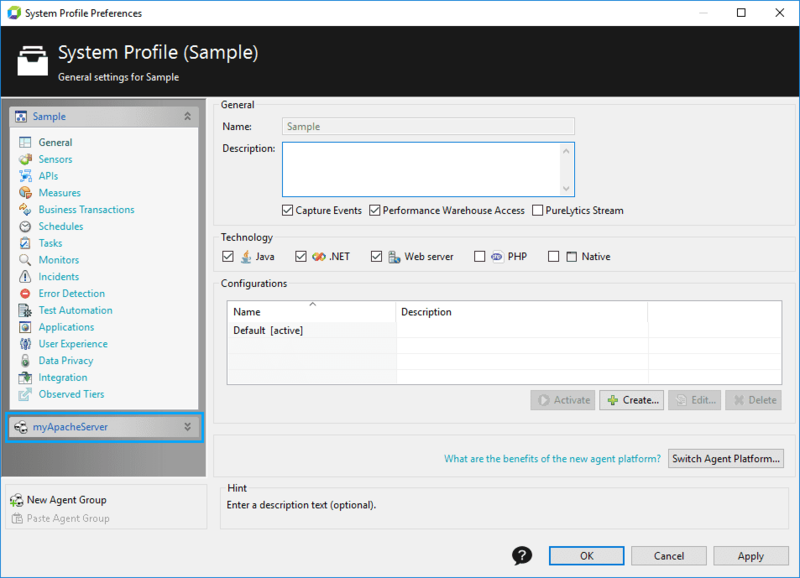 Open the System Profile Preferences dialog box for newly created System Profile check for the Agent Groups.